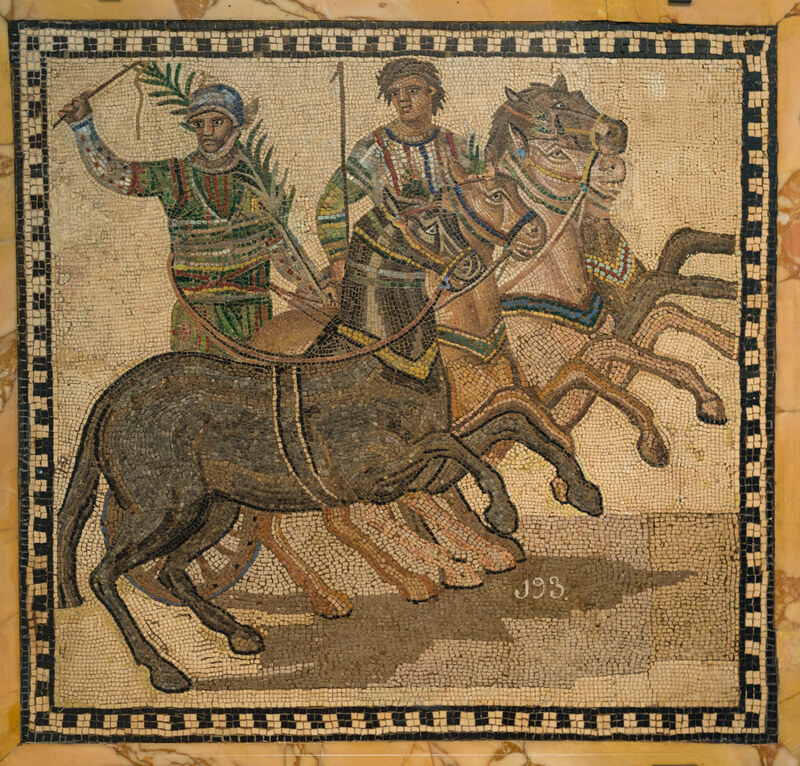 To relax, Romans liked to watch: theatre shows, chariot racing and gladiator fights. Roman theatres would be shaped like a semi-circle. Most shows were funny comedies - the audience would enjoy watching actors dance and mime wearing elaborate masks and costumes. The actors were always men, each playing several roles. They wore different coloured wigs - an old man had a grey wig, a young man had a black wig and a slave had a red wig. Chariot races would take place at a circus - charioteers would race on two-wheeled carts pulled along by up to four galloping horses around an oval track. There would often be crashes, when chariots overturned and horses and drivers were killed. The Romans liked to bet on who would win and would cheer and shout during the races. Gladiators would fight in large arenas called amphitheatres. People enjoyed watching them fight each other and also fight wild animals like lions or bears. Their weapons included: nets, spears, swords and three-pronged tridents. Although the gladiators were usually: slaves, prisoners of war or criminals, they would be treated like glamorous superstars. When a gladiator was beaten (but still alive), the crowd would either put their thumbs out if they wanted him killed or close their thumbs onto their fingers if they thought he had fought well and wanted him to live.